Exception message: No parameterless constructor defined for this object. Ok so this particular custom web part works fine when you drop it onto a page using the SharePoint UI, so it seems that SPD has a problem with it, Google turns up some interesting results which may be relevant to you but didn’t help me. Adding them using the feature provisioning framework, as I discussed in this post. In the case of this web part, there were 2 properties which were custom enumerations, AggregationSource and AggregationScope. Removing these properties from the markup fixed the problem and the web part worked correctly in both SPD and in SharePoint when creating a new page. In this case the property is a UInt type, if you ignore this error, in my environment SharePoint would throw the same “No Parameterless Constructor” exception. 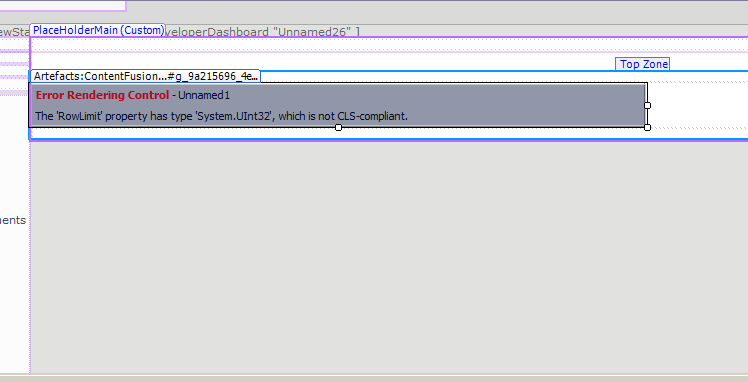 One property (the non CLS-compliant one) is exposed as WebBrowsable (so it’s visible in the SharePoint UI) while the other (CLS compliant) property is the one you’d reference from SharePoint Designer, since they are both public this works out ok. The property not exposed as WebBrowsable is not serialised to the content database or to a .webpart file if you export the web part from the SharePoint UI.